InvIT (Infrastructure Investment Trust) is an asset class specifically pertaining to the infrastructure space. It is a collective investment vehicle that pools together funds from long-term investors to acquire income-generating infrastructure assets from developers. It can be looked at as a portfolio of underlying operating Infrastructure Assets with a regular and stable stream of income and cash-flows. These cash-flows are passed on to the holding Trust (InvIT) to be paid out to unitholders in the same manner as it accrued to the Trust. IRB InvIT is a Trust owning a portfolio of 7 Toll Road assets with gross toll collection of ~ Rs. 14.9bn for FY 2017-18. The Trust was listed on 18th May, 2017 on both exchanges BSE and NSE. Presently, the Trust has unit capital of Rs 59.2bn and EV of Rs 74.7bn. Brief History of the underlying assets? What is the projected Internal Rate of Return (IRR) for the Trust during the lifetime of the Trust? Post-acquisition of Pathankot project, the IRR is likely to increase in the range of 12.5 to 12.75% on issue price of Rs 102. What are the underlying assumptions for reaching the indicated IRR? Traffic Growth is assumed to be ~ 5.5%, Inflation at ~ 4.5% and cost of external debt at 8.15% p.a. NHAI Premium / Revenue Share As per Concession agreement Known amount or percentage – no surprises Paid to NHAI. If Revenue share – adjusted against gross revenue and net revenue flows to P&L. If Premium payment – reported on Balance sheet and adjusted in Cash flows. O&M expense ~10 to 15% of Gross Revenues Fixed Price contract with Project Manager Paid to Project Manager. Loan Repayment: Scheduled in line with the cash-flow build-up of asset acquired with ballooning repayment schedule over the next 15 years. The net amount of cash at the Trust level, after meeting these obligations, is called the Net distributable cash-flow (NDCF). The Trust is obligated to distribute NDCF to unitholders – in the same format as received from SPVs. Why capital reduction is considered a part of yield / IRR? Capital reduction is the payout made corresponding to the repayment of loan by underlying SPVs to the Trust – in turn generated from operating cash-flows of the SPVs. Capital reduction forms a part of distribution for Business trusts / REITs globally and is included in calculation of returns/yield for the Trust. 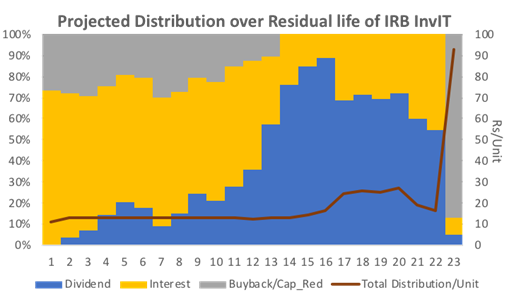 The indicative yield, for InvIT, works in same manner as one would calculate IRR on investment, meaning – the payouts include part capital reduction and part return/yield – totaling up to reflected IRR (refer illustration below). In the case of InvIT – the payout will be spread over the residual life of the Trust (based on underlying assets, which for IRB InvIT currently stands at approx. 23 years) and will be paid out in three modes – Interest, Capital reduction / Buyback and Dividend. What should be treatment of Capital reduction in the books of accounts of the investor? Capital reduction needs to be shown as the adjustment to the Investments value in the books of accounts. What are the tax implications on distributions? No TDS shall be applicable on Capital reduction/Buyback and Dividend. Capital reduction/ buyback will result in reduction in the cost of Investments. Dividend is exempt from tax as per the limits specified in the Income Tax Act. Interest shall be taxable in the hands of unitholders as per relevant tax slab. However, TDS is applicable at the time of distribution of interest as per chart below. What is the rate of TDS applicable for FY18-19 on the payouts i.e., Interest, Dividend and Capital Reduction? – Stay in India for 182 days or more during the tax year (i.e. FY2017-18). – for an Indian citizen who leaves India in any financial year for the purpose of employment outside India. HUF HUF is generally regarded to be a resident in India in any previous year unless its control and management is situated wholly outside India. LLP LLP is generally regarded to be a resident in India in any previous year unless its control and management is situated wholly outside India. Company Company is said to be resident in India if it is incorporated in India or if the place of effective management is in India. Mutual Fund Under Section 10(23D) of the Act, any income earned by a Mutual Fund registered under the SEBI Act, 1992, or a Mutual Fund set up by a public sector bank or a public financial institution, or a Mutual Fund authorized by the Reserve Bank of India would be exempt from income tax, subject to such conditions as the Central Government may by notification in the Official Gazette specify in this behalf. Further, Section 196 provides that tax is not required to be deducted for any sum payable, being in the nature of interest or dividend in respect of any securities owned by mutual funds specified under section 10(23D) of the Act. How we can claim the TDS certificate in case not received? How do I receive my capital back? If we consider the Trust to be a perpetual entity, which keeps growing by acquiring more assets and distributing returns from the operational cash-flows of those assets – the capital investment and return will be based on market value of units at the time of purchase and sale. Traffic Growth of 5.5% p.a., WPI of 4.5% p.a. What is the Debt Equity ratio for the Trust? Presently Debt Equity ratio is 0.25:1 and it can borrow upto 1:1 Debt Equity ratio i.e. acquire Rs 45bn worth of assets (grow to 1.6x present size) with debt funding and without further equity dilution subject to the approval of the unitholders. What is the rating of Trust at present level of debt? What is the growth strategy for the Trust? Organic growth: In the form of increase in Toll revenues; expected around 9.5-10% annually. Inorganic growth: Through acquisition of more projects from road developers across the industry, at an IRR conducive to the risk-reward profile of and return accretive to the Trust. The pace of project awards by NHAI is very encouraging and opens up an additional stream of projects based on Hybrid Annuity Model (HAM). HAM projects will provide a stable stream of annuity based cash flows and improve cash yield to unit holders from day 1. Toll assets will imply a higher IRR – conducive to the traffic risk they come with. The Trust will thus target a healthy mix of Toll and HAM projects to ensure high cash flow visibility as well as improvement of overall IRR. Within the sponsor Portfolio which has given Right of First Refusal and Future Asset Agreement with the Trust, the Trust has the option and visibility to acquire assets with a project cost of ~Rs 315bn that will become eligible for acquisition over the next 1-5 years. What is the time horizon for next acquisition? We expect acquisition of another 2 to 3 assets before end of FY20 depending on the availability of asset and approval of unit holders. Is there a conflict with Sponsor over Toll collections as well as Asset Transfers? Toll Collection: Each SPV has its own set of executives and operators for managing toll plazas and the Sponsor doesn’t have any involvement in this regard. Further, right from assessment/ identification of category of vehicles to collection tally at each operator’s end there are robust systems, checks and audits in place to ensure no leakage and/or discrepancy in collections can occur. Asset Transfers: The initial portfolio of six assets was valued on the basis of most conservative assumptions (4.5% Inflation + 5.5% traffic growth – resulting in 9.5-10% revenue CAGR) in line with investors’ expectations as well as their expected yield (12%). The seventh asset had a residual life of 17 years and was valued using same base assumptions – as the rest of the six assets. The acquisition was voted in favor by over 83% of the unitholders who voted and IRB Infra (being a related party) didn’t participate in the same. In future as well, each of the assets as may be offered from the Sponsor’s portfolio will be vetted and voted for by the non-sponsor unitholders only – in line with market determined yield and thus valuation. IRB InvIT can also acquire assets from other developers and has been evaluating such opportunities. It is in IRB Infra’s interest to aid growth of IRB InvIT to ensure long term continued visibility of asset capitalization through this vehicle and has Rs 315bn worth of assets that can be offered to the trust over the next 4-5 years. The Factsheet and frequently asked questions (“FAQs”) are provided for information purposes only. They do not, and should not be deemed to constitute legal, financial, investment, tax or any other advice in relation to InvIT in general and IRB InvIT Fund “(IRB InvIT” or the “Trust”) in particular. It should not be relied for any investment decisions. Also, these FAQ’s contains certain forward-looking statements, and may contain certain projections. These forward-looking statements generally can be identified by words or phrases such as “aim”, “anticipate”, “believe”, “expect”, “estimate”, “intend”, “objective”, “plan”, “project”, “will”, “will continue”, “will pursue”, “seek to” or other words or phrases of similar import. Similarly, statements that describe strategies, objectives, plans or goals are also forward-looking statements. regulatory changes and future Government policy relating to the transportation industry in India. By their nature, certain market risk disclosures are only estimates and could be materially different from what actually occurs in the future. As a result, actual gains or losses could materially differ from those that have been estimated. Forward-looking statements and projections reflect current views as of the date hereof and are not a guarantee of future performance or returns to investors. These statements and projections are based on certain beliefs and assumptions, which in turn are based on currently available information. Although the Investment Manager believes the assumptions upon which these forward-looking statements and projections are based are reasonable, any of these assumptions could prove to be inaccurate, and the forward-looking statements and projections based on these assumptions could be incorrect. None of the Trust, the Trustee, the Investment Manager and their respective affiliates/advisors have any obligation to update or otherwise revise any statements reflecting circumstances arising after the date hereof or to reflect the occurrence of underlying events, even if the underlying assumptions do not come to fruition. There can be no assurance that the expectations reflected in the forward-looking statements and projections will prove to be correct. Given these uncertainties, readers are cautioned not to place undue reliance on such forward-looking statements and projections and not to regard such statements to be a guarantee or assurance of the Trust’s future performance or returns to investors. All prospective investors should consult their own professional advisors before making any investment decision regarding InvIT and the Parties to the Trust shall not be liable for consequences of any reliance on the FAQs. The FAQs do not, and should not be deemed to, constitute solicitation for investment, or invitation to offer, or offer in relation to securities of the Parties to the Trust. The information provided in the FAQs is subject to change and the Parties to the Trust do not have any obligation to update the FAQs from time to time. All readers should independently verify the adequacy and accuracy of information provided in the FAQs.